After making this painted Polka Dot Tablecloth last week, I’ve been inspired to test the process with different patterns and colors. 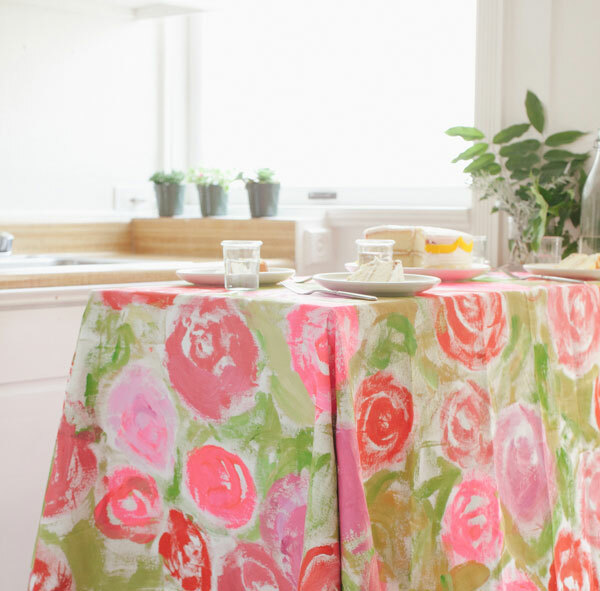 We made this tablecloth based on some vintage fabric I had in my fabric stash. We had Paul mix up a few colors and I’m so pleased with the way it turned out! The process took only a few hours because the pattern is so abstract and imperfect. I can’t wait to use it at my next party! 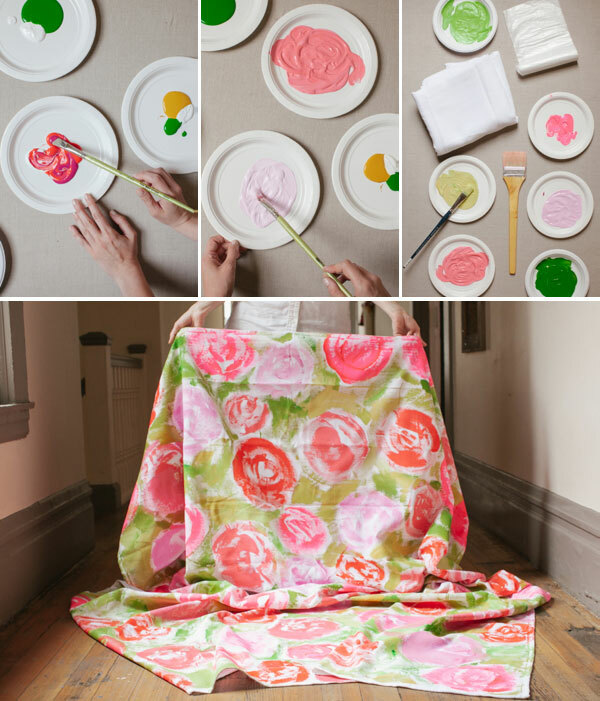 Step 1: Lay out the drop cloth and place the tablecloth on top. Step 3: Begin painting. 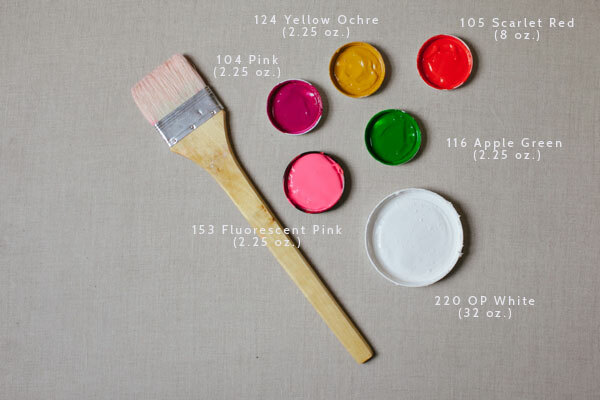 Start with the flowers, being sure to space the different colors evenly. Paint loosely and with confident strokes. The less you think about making them look perfect the better they will turn out! Step 4: When you have enough flowers, start adding in the green leaves. 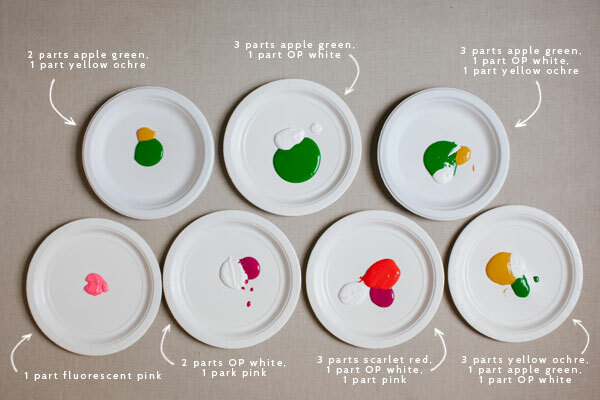 Again, be sure to add the different shades evenly through the painting. Step 5: Let it dry completely. Increible!!! Hauries de posar un video sobre com ho has fet perquè em moro de ganes de fer-ho!!! Can you explain step 3? Are they just swirls? Is the shading the tablecloth showing through or white paint? You don’t really address the actual process of painting it. Thanks! Hi Lindsay! We loosely painted circles and then filled them in with simple swirls and brush strokes. We tried to make sure they weren’t too perfect. The white in the pattern isn’t paint, its the fabric showing through. I hope this helps! I love this! Does the paint make the cloth crunchy? Or does washing it afterward alleviate that? Since the paint is made for fabric, it doesn’t get crunchy. But it does make the fabric a little stiffer than a normal. OK, this is fantastic. Very vintage-y DIY with high end results. I love any DIY where the advice is “the less you think about making them look perfect the better they will turn out” Such a great idea. Never mind a table cloth…I think this design would look beautiful as a full circle skirt (as long as the fabric feels good). Very nice! It’s DIYs like this that keep me constantly coming back for more, Jordan. 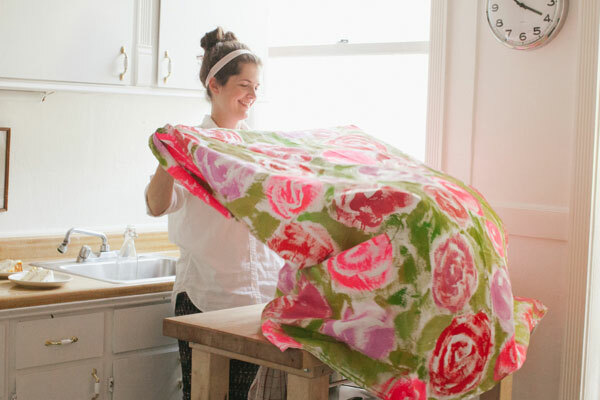 What a beautiful project that looks anything but do-it-yourself. As always Jordan, just lovely. I will be making these for my mother’s birthday. I wouldn’t have believed in a million years that this was DIY. So gorgeous, I can’t wait to try it! Perfect! I’ve never tried my hand at any DIY’s but this looks too beautiful too resist. Thanks! this is beautiful. and LOVE the advice about not thinking too much about it! Love this post! I have been making my own plans to make a fun picnic tablecloth. 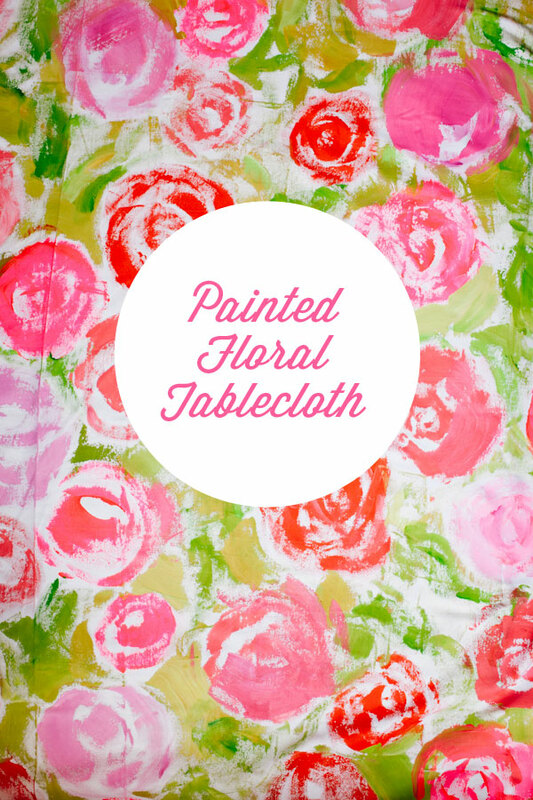 I was going to go with the typical checkered tablecloth in a fun color, but the flowers are a nice, fresh addition! This is truely a work of art! The table cloth is so beautiful! It reminds me of Lily Pulitzer. Can’t wait to try this for my next event! I’ve said it before but I’ll say it again – you’re head must be one great place! 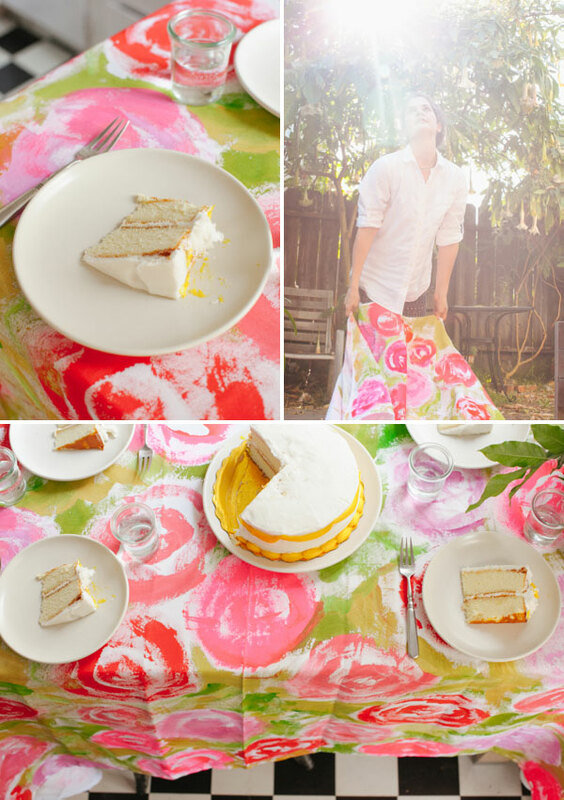 Seriously, such a beautiful tablecloth! I love how painterly it is. Great job. Gorgeous. And you’re so good at painting flowers! This looks great! The colors and patterns remind me of some tea towels I made recently using a celery for a stamp! Will have to try a tablecloth next! Thanks for the inspiration! Whoa this is so beautiful! I might have to make one! I love how you could customize this! I am loving this so much! It is amazing! Wow, this is just so beautiful!!! I am a sucker for anything floral. I ought to try this out, it looks fantastic! Can you wash the table cloth, or will it ruin it?